Summer time, Summer time, Summer time…. Here in East Tennessee, we are blessed with distinct season and summer is one of my favorites! Rosy checks, shorts and Chacos quickly become the dress code. As you venture out for summer activities, make sure you and your family are prepared for the unexpected- water safety and heat stroke. Water safety should be a high priority! Swimming is a popular summer activity and preparing yourself and your family is key. Did you know that drowning accounts for over 4000 deaths each year? One way to help reduce the number of victims is to make sure everyone has enrolled in swim lessons and/or use life vests properly to ensure safety. Drowning victims tend to be quiet and normally don’t make a lot of noise. If people are missing, especially children, look in the water first. The victims can appear to be lethargic and/or will be found unresponsive either floating in the water or submerged. Quick action is required for a positive outcome for a drowning victim. The quicker they are removed from the water and first aid administered the greater the chance of recovery. What should you do if you find someone with signs of drowning? Check to see if the victim is conscious or unconscious. Ask someone to call 9-1-1 and get an automated external defibrillator (AED). Attempt to remove the victim from the water. Perform “rescue breathing” if necessary. This can be started in the water, but all other care requires the victim to be out of the waters. If the victim is breathing place them on their side in the recovery position to prevent aspiration, which is inhaling vomit into the lungs. Be on the lookout for dry drowning or secondary drowning too. This can occur up to 24 hours after swimming. Monitor breathing, listen for a persistent cough, chest pain, mental status and pay attention to skin color. Call 911 if you suspect dry drowning- the victim will need oxygen supplementation. Heat Stroke is another dangerous situation that will require immediate medical attention. Heatstroke occurs when your core body temperature rises above 104 degrees Fahrenheit, causing your internal organs to not function property. Heatstroke also called sunstroke, is a result of external environmental factors, such as being outside or exerting yourself physically on a very hot day. Susceptibility to heat stroke increases with age, weight, some medications and your medical history. Keep in mind, some heart medications, such as beta blocker, calcium channel blockers and diuretics can cause the body to have an adverse reaction to the heat. What can you do if you suspect someone is experiencing Heatstroke? Instruct someone to call 9-1-1, heatstroke is life-threatening. Attempt to cool the patient’s body. Get them out of the sun, provide them with a cool drink (no caffeine) and use cool air to fan them. CPR Choice offers first aid training to help prepare you and your family in these types of medical emergencies. Having the skills to perform CPR in an emergency can make the difference between life and death. Sign up for a class today. Visit www.cprchoice.com and chose a convenient location & class. We offer classes all over the East Tennessee area and our instructors are the best around. Give us a try! Using tourniquets can save lives. However, it is important to be knowledgeable about the technique. In the 2010 AHA CPR and First Aid Guidelines: the use of tourniquets has been endorsed in both the professional setting and in the public sector. Tourniquets should always be a last resort to effectively stop bleeding and you should always try to control with direct pressure first. The tourniquet should be utilized for extremity bleeding only and placed approximately 2 inches above the injury. It is important to note that the bleeding will become worse before it gets better, continue tightening the tourniquet until bleeding is stopped. Specifically designed tourniquets do work better than improvised ones. Make sure to note the time in which the tourniquet is applied and pass this information on to EMS providers. There are potential dangers in prolonged tourniquet application, but the benefits of controlling life threatening bleeding outweigh the risks. Tourniquets were not endorsed for a wide range of studies as they can damage soft tissue, and applied incorrectly they can make bleeding worse. It wasn’t until the most recent military experience that they were brought back into use. Military study in the Middle East conflict proved them to be a necessity, and has pushed medicine to explore great advances in limb re-perfusion. Now they are being utilized even in surgical settings- enabling doctors to limit bleeding in the controlled setting as well. May is National Melanoma Skin Cancer Awareness Month! The American Academy of Dermatology designated May as National Melanoma Skin Cancer Prevention month and the main purpose is to raise awareness about skin cancer. Skin cancer is the most common type of cancer in the United States and is the result of accumulated sun damage to the skin over long periods of time. Early detection is crucial in the fight against melanoma, because it does not respond well to chemotherapy and the best course of action if to remove the affected area. If not caught early, it can spread internally to other parts of the body. Melanoma or mole cancer – appears as a dark brown spot that will slowly increase in size. Usually different shades of brown, blue or black can occur within the spot. While they can appear anywhere, the most common areas are the back, arms, and legs. This type of cancer is very serious and can spread internally. Remember early detection is the key. Basal Cell Carcinoma – this is the most common type of skin cancer and usually occurs on the head, neck, back or chest. It can appear in different forms, but the majority of the time it looks like a small pink or pearly raised bump that later develops as a non-healing sore within its center. It will slowly enlarge and gradually grow deeper and deeper into the skin. This type of cancer usually does not spread internally and can be treated quickly and easily if caught early. Squamous cell carcinoma – occurs most likely on the head, neck, hands and arms. Its appearance is rough, warty-like yellowish and hard with a pink edge. The center can erode causing a sore that will bleed easily. This type of cancer will spread and is usually confined to the lymph node glands beneath the skin. Again, easily treated if caught in time! 2 words—-APPLY SUNSCREEN! Sunscreens are most effective when applied 20-30 minutes before sun exposures. Also, keep in mind approximately one ounce is needed for an adult body. It’s that easy, using a sunscreen of 30 SPF or higher and regularly applying to the constantly sun exposed areas is all you have to do! You should also avoid intentionally tanning your skin either with natural light or a tanning bed. Take the time this month to make a skin cancer checkup appointment with a dermatologist. And start paying attention to your body- so you can be aware of any changes. CPR Choice wants you to be around a long time! Do it now, do it for you, do it for your family! June 1-7 is National CPR and AED Awareness Week. We’re pleased to support the American Heart Association and its important mission to increase survival from cardiac arrest. We’re asking all members within our community to please take one minute of your day to learn the lifesaving skills of Hands-Only™ CPR. Also, for CPR awareness week we are hosting a free community CPR class called, Knoxville Knows CPR! Our mission is to save lives; both in the classroom and in our community. We think this is the best way that we can accomplish both! Everyone needs to learn CPR! I am requesting your help addressing a health concern that impacts our entire community. According to the American Heart Association, 90 percent of people who suffer out-of-hospital cardiac arrests die. CPR, especially if performed immediately, can double or triple a cardiac arrest victim’s chance of survival. If you are called on to give CPR in an emergency, you will most likely be trying to save the life of someone you love: a spouse, parent, child or friend. Many bystanders feel helpless when they see someone go down because they don’t know what to do. Just learning 2 simple steps can make a huge difference in the victim’s outcome. We will be teaching hands-only CPR and focusing on how learning 2 steps can save lives. 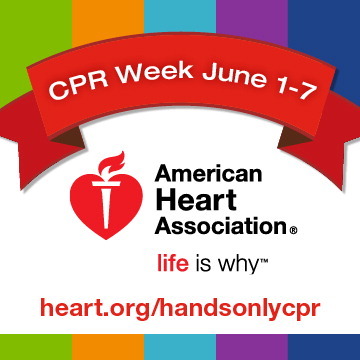 If you can’t make it to our class, at least visit the AHA website and learn Hand’s Only CPR. You may wonder why this is such an important cause. Your life is why! In just one minute, you can learn the two simple steps of Hands-Only™ CPR. Please watch the video any day from June 1 through 7. Then share the link with family and friends, and ask them to learn CPR. Thank you so much! Learn to save a life! As personal trainers , you’ve made the decision to go into the growing and ever evolving world of exercise science. Cardiovascular training and weightlifting are important parts of keeping the heart and body healthy. However, it is important to understand the risks involved and be prepared to act should an emergency occur. Exercise tolerance is defined as the ability of the cardiac, pulmonary, and vascular systems to meet the requirements generated by large muscle use. Simply put, can the body move enough oxygen to the muscles fast enough? If one system fails to keep up, your client could experience cardiac arrest and need CPR. While the goal is to better ones exercise tolerance, pushing someone too hard or to0 fast could be detrimental. It is important for personal trainers to form a close relationship with all their clients in order to create a program within his or her functional physical capabilities. Ultimately, it is the trainer’s responsibility to understand your clients’ medical history and physical boundaries. Thorough understanding of CPR and the ability to act responsibly are critical in the moments between cardiac arrest and EMS arrival on scene. Immediate CPR and AED use could be the difference should a life and death situation present itself. We not only strongly urge personal trainers to receive CPR training, but most personal training certifications such as the American Council on Exercise (ACE) or the Aerobics and Fitness Association of America (AFAA) require it. Many gyms are also equipped with Automated External defibrillators (AED) and require personal trainers, fitness instructors and staff to be certified in both CPR & AED. Sign up for our Heartsaver CPR & AED course! For more information on the correlation between exercise and heart failure, please visit the American Heart Association. Epinephrine Pens, or Epi Pens, are special syringes that are pre-filled with a prescription dose of epinephrine to be administered in the event of a severe allergic reaction. Epinephrine Pens can save the lives of people who suffer life threatening reactions to allergens such as bee stings, nuts and other foods. The dosage is often suited to the person whom it was prescribed. It is important for people who have been prescribed an Epinephrine Pen to always carry it with them and make sure co-workers, teachers and peers know how to administer it in the case of an emergency. Operating an Epinephrine Pen is very straightforward. The first step is to remove the safety cap (on the back). The person administering the shot will hold the pen in their fist and push the needle end firmly into the victim in the side of the thigh muscle (between the hip and the knee). Hold the epinephrine pen in place for ten seconds, taking care to not twist or move the needle. After 10 seconds, the Epinephrine Pen is removed and a protective, safety sheath will cover the needle. After giving the injection rub the area of the shot for 10 seconds, to help get the medication into the bloodstream. One should also make note of the time the shot was delivered and then dispose of the Epinephrine Pen in a designated sharps container. If at all possible, the person who is prescribed the Epinephrine Pen should deliver the shot to themselves, but in the event of a sudden, severe reaction, may need help. Advanced medical help should be notified and advised of the type of allergy, approximate time of the reaction and the time the epinephrine was administered. It is important to stay with the victim until medical help arrives. It may take a few minutes for the medicine to start working. Sometimes the first exposure to an allergen may result in life threatening anaphylaxis reactions. Medical professionals also stress that delaying treatment with epinephrine in the case of the severe reactions is more likely to result in death. It is because of this warning, more schools are stocking extra Epi Pens and training personnel on their use. Tennessee passed legislation in 2013, joining 28 other states, to allow schools to keep epinephrine pens in stock and administer them in the case of an emergency. Learn how to administer Epinephrine in one of our Heartsaver first aid classes. We also offer a Pediatric specific first aid class for daycares, churches, preschools and businesses working with children. Our first aid course covers a lot of subjects and will teach you what to do in an emergency. Click here for more info about the prescribed drug Epinephrine or to learn how Epinephrine works. Caring for children is a privilege for those who are called to do it. It is also an enormous responsibility and one that caregivers should be as prepared as possible to undertake. Being able to care for a child in their own home provides a comfortable, familiar environment for the child where they feel safe and secure. However, according to the CDC accidental injury is the leading cause of death in children under 14 in the United States and more of these accidents happen at home than anywhere else. Being certified in CPR and First Aid arms caregivers with the skills they need to act in a timely manner if an accident happens. The leading reasons children under the age of 4 are seen in the emergency room include falls, being struck by something, allergic reactions, poisoning, burns, and being cut or pierces by something. Although most of these can be seen as preventable, anyone with children knows they are quick, curious, and often times fearless. Accidents can happen even when parents are in the same room with a child. CPR and First Aid training equips nannies and babysitters to immediately respond to these situations and many more and get the child the time sensitive medical help they may need until parents can be notified and get to their child. For parents, knowing their caregiver has these skills gives them piece of mind when they are leaving their children. Preventing accidents is always the first priority, but in the event they do……and they will……happen, feeling confident in your ability and knowledge to handle the situation is invaluable in keeping the child calm, comforting them and getting them they help they need until mom and dad can be there. Sign up for a Pediatric CPR & First Aid class today!